I’ll admit I wasn’t an avid concealer user until last year. I just didn’t really see the point of it, I didn’t understand the magical tricks you can do with concealer I thought it was all for dark circles and blemishes. Oh, how wrong I was. Concealer is fantastic and can change a makeup look in an instant, you can use it for an array of DIY things such as, instead of using a highlighter under your brow, use a light concealer. You can use it as a very make shift contour. Anyway the point is, I love concealer. I do have my one favorite one that I will list below because it is under 10$ but, I did find another 9 all under 10 $ that are just as good and just as ‘concealery’. This NYX concealer is cheap, it’s good and it does its job. Well, almost. I don’t have dark circles under my eyes so I have never used it for that reason however, I have heard it’s not great at doing that. It isn’t ‘heavy’ enough but, for an everyday concealer it’s fab and under 10$. I bought this in a drugstore on a massive whim. I had seen a million beauty gurus applying strange greens and purples all over their face and I had to do it too. I didn’t use the little brush it came with I used my own concealer brush but, aside from that this little palette worked a treat. The different colors sort out different problems on your skin. The green reduces redness, the purple brightens skin tone and the orangey, coppery color evens your skin tone and discoloration and can even help with dark spots on the skin. This concealer is an old time favorite. It works so well with my skin and it’s super cheap too. It is mean to stay a whole 24 hours and I do feel when I wear it, it does stay. It doesn’t look as fresh as it did the day previous but, it’s still there. It’s a brilliant concealer and an old time classic. This concealer is my absolute favorite. It’s the one I wear every single day, 7 days a week. I love it so much, it literally does everything. Some people cannot get on with the ‘stick’ concealers and I agree sometimes but, this one for me is fantastic and I would recommend to anyone who can’t find something that works for them to give it a try. One of the many things I love about this concealer is that it blends, super naturally. If you’re looking for something less natural, this isn’t for you and if you have super dark circles I don’t think this will do the job but, if you’re somewhere in the middle this concealer is flawless and under 10$ where can you go wrong? I personally have never owned this product. I have however heard a million and one good things about it. Apparently it gives you a flawless look and goes amazingly well on middle aged skin. This doesn’t mean it wouldn’t work for a younger category of people, it just does what it’s good at! This palette is incredible for beginners. When I was playing around with concealer for the first time last year this palette was perfect for me. I learnt so much about my skin and what works and doesn’t work and even now to this day I use this palette on a regular basis because I love all the different color combos! This stuff is super pigmented which is amazing for people like me who really use concealer to cover up big imperfections. The only issue was the brush, it was a little weird but, I quickly got over that. I use my concealer brush anyway so, the application brush wasn’t a big issue. For the price this concealer is amazing. It’s super pigmented and lasts for ages, the only thing I wouldn’t recommend is using it if you do have slightly older skin as the thickness of it may sink in to creases and make them appear to be deeper than they are. Saying that, it is perfect for everyday use and is amazing at its job. I do love this palette not only because it’s super cheap and does its job (something I love) but, it has a different spectrum of colors which, for me living a lot of the time in a hot country really helps me save time and money because I have a different color for every shade I can be. 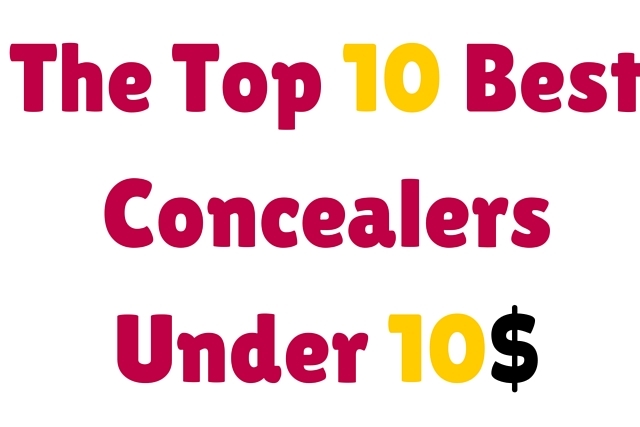 I hope you enjoyed my post on The Top 10 Best Concealers For Under 10$ if you did please let me know in the comments below!